Last night, I did a portrait of illustrator and concept designer Ralph McQuarrie, for a little show that will be at the Industrial Light and Magic shop in the next few days. A friend of mine, Christian Alzmann, in the art department there asked me if I would paint something that he and the other artists there could give to Ralph's Widow as a show of appreciation for how much Ralph meant to us, and how much he as inspired us all. Other artists and former artists from the ILM art department are also doing pieces for the show- it should be pretty cool! 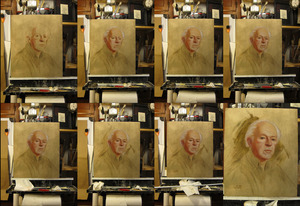 Here, I am posting the final painting as well as a composite of the 3 hour painting process. There was probably another 3 hours of prep time involved beforehand.